Will grippers become the brainy aristocrats in factories and warehouses that run the show? Who are the gripper-meisters? What are they mastering now…and why? 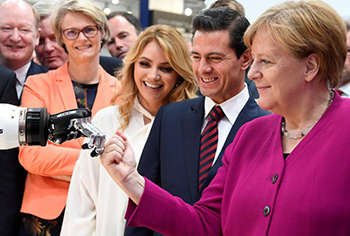 The next time Angela Merkel does a fist bump with a robot’s gripper, it may come away knowing way more about the German Chancellor than she cares to let on. A haptic sensor in the gripper may opine on her health after taking her pulse; or tell if she’s being truthful with Till Reuter about how she really feels toward KUKA’s new cobot, the LBR iisy. A 3D vision system may analyze her skin and brand of hand cream, while 25,000 data points on her face are carefully collected for a bit of analytics. Throw in the gift of speech and the gripper may even tell her a thing or two. The days of only your doctor knowing for sure are in jeopardy, because not much will escape the scrutiny of a smart gripper…if it takes an interest in you. The hard-working chunk of metal on the end of a robot’s arm is waking up to the reality that it can be brainy as well as brawny. And the awakening is happening fast. Advanced chips, on-device computing, 3D vision, haptics, new materials and designs, predictive data, analytics, machine learning, and miniaturization are beginning to co-locate at the business end of a robot’s arm. And best of all, this evolution of the robot gripper into a higher order tool for both fabrication and feedback, makes a lot of sense. For cobots, the way forward is pretty clear. If a gripper can take on the task of being aware and careful of human collaborators working nearby, why not make it capable of other jobs in addition to safety? The logic is compelling. A gripper is already intimate with nearly every workpiece fabricated and/or assembled on an automated production line. In Factory 4.0, it’ll most likely be the sole handler of everything. As such, it will be at the epicenter of an unprecedented flow of valuable data, much of it created at the intersection of gripper and workpiece. It would make sense to enable a gripper to harvest and communicate that data…and to learn from that data. In a connected factory, the gripper could create, harvest and communicate data with other machines, either upstream or downstream, as well as with remote grippers working jobs from raw materials to finished products. And, when Cloud connected, it can communicate with any other gripper anywhere on Earth…or anywhere else in the cosmos. For example, one initial and obvious job for an enlightened gripper would be quality control or quality assurance. According to MetricStream “quality underperformance, i.e. quality defects [cost] between 10-30% of a company’s revenue”, plus lots of customer dissatisfaction. Saving a bit of that 10-30% should be motivation enough to smarten up a gripper’s work life. Piling on ever more jobs for a gripper to do produces ever more data to be analyzed for improvements in performance, process and products for every aspect of fabrication…and for logistics as well. Developers who have recently moved intelligent innovation to the end of a robot’s arm are being rewarded for their foresight. Grippers are now doing things they’ve never done before—and doing them well. So well, in fact, that investors are pouring millions of dollars into advancing gripper tech even further. Early on, the nascent smart gripper is being used to replace previously human-only functions. Repetitious, mind-numbing but necessary jobs for humans like machine tending, welding, bin picking, component assembly, and quality control are now quickly succumbing to grippers infused with a bit of intelligence. Soft Robotics is another with inventive gripper tech coupled to machine learning. It just picked up $20 million in investment for its “soft” three-fingered gripper system. The interesting idea here was that Soft Robotics built intelligence into the gripper material itself so that the robotic system could easily reach out, grasp and manipulate objects. Andrew Ng’s $175 million AI fund has sprouted Landing.AI with its visual inspection system and learning algorithm that, “after being trained on just a few images, can be used to spot imperfections in small electronic components or camera lenses.” Foxconn’s assembly robots will use the vision system to improve upon Apple smartphone production. Ahead for smart grippers is an amazing future that includes doing original work at many processes which humans have never attempted because of complexity or time or cost, or all three. One with a mega upside: chemistry. The laborious-in-the-extreme process of searching for and discovering new compounds useful for pharmaceuticals and industry is one that may end up being the exclusive province of AI and grippers. Faced with having to run lab experiments on 100,000 materials to discover a single new compound is nearly impossible without AI to help whittle down the 100,000 to maybe a few thousand good predictions. Of course, conducting a lab experiment for each of the remaining few thousand predictions is still a daunting prospect. The 100,000 is what Nicola Marzari, a researcher at Switzerland’s École Polytechnique Fédérale de Lausanne, confronted in his quest for “3D materials that can be peeled apart to create 2D materials of just one layer.” Think, graphene. AI plus a gripper bristling with sensor arrays and computational power might well make major discoveries in new drugs and industrial compounds that might even change the world, create massive new industries…and maybe millions of new jobs. Jobs heretofore completely unimagined. With such a mind-blowing future ahead for grippers, what’s it like for Dr. Markus Glück, managing director R&D at SCHUNK, when he walks into his laboratory each day? According to Dr. Wolfgang Wahlster, CEO and Scientific Director of the German Research Center for Artificial Intelligence, “SCHUNK’s JL1 [Co-act gripper] is a perfect example of a state-of-the-art, smart, end effector.” It also won the 2017 Hermes Award for best technology. That’s a tall order and Dr. Glück knows that he has to deliver; it’s where smart manufacturing and Industry 4.0 are headed. He says that he’s ready and already working the future of the Co-act lineup. A quick look around the industrial space in gripper tech seems to put SCHUNK’s 5-gripper Co-act lineup as the frontrunner in the pursuit of smart grippers (See: Global list of gripper developers for both manufacturing and logistics). To reprise Badicore: “There is seemingly no end to what an end effector or gripper can do.” In a recent interview, Dr. Glück seems to have Badicore’s “no end” squarely in his sights. It’s a future in which he says the company sees “attractive possibilities to use machine learning for gripping…it will be much more a case of machine learning opening up new possibilities for autonomous gripping process optimization. Amazingly, just two short years ago, any discussion that lumped together AI, grippers and intelligent manufacturing, or one that seriously considered a gripper for “monitoring” the production cycle, was more like theoretical lab chat than anything real-world ready. Times have certainly changed, and fast! It may well fall to smart grippers to be the automation industry’s differentiators: the brainy aristocrats in factories and warehouses that run the show.